Which costs are related to an ETSO application/authorization? Part I, table 1: flat fee for new applications (incl. major changes). The flat fee covers a period of 12 months. 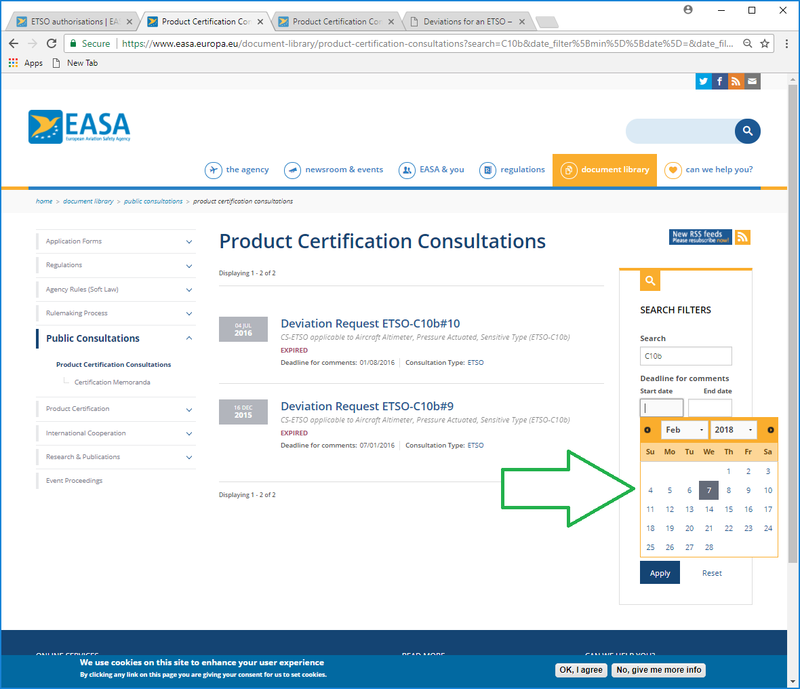 If the product cannot be certified within 12 months EASA will issue another invoice covering the additional days until the date of approval; see Annex, explanatory note (3). Part I, table 2 for derivatives. Only applicable to APUs. Part I, table 6 for annual fee. Annual fee is only charged when the certified ETSO article is installed or used in more than 50 aircraft OR continued airworthiness activities have been carried out for the ETSO article. Approval holders are asked by EASA once a year to provide an update on their articles regarding the value of the product and the number of installations. The annual fee for articles in the same value category is reduced as specified in the lower section of table 6. Continued airworthiness activities are charged on an hourly basis. Approval holders of non-EU design pay a reduced annual fee. Part II, point 1 for hourly fee. The current hourly rate (March 2014) is 233 €. Part IV, annual inflation rate: All fees & charges are adapted annually. How do I apply for an ETSO authorization? Applications for ETSOA are made through EASA Form 34. Compliance with the applicable ETSO – standard(s) as well as Part 21 shall be stated in a DDP (Declaration of Design and Performance). An application from an EU organization for the EASA approval of a new ETSOA. This requires that the applicant has at least applied for Alternative Procedures to Design Organisation Approvals (ADOA) and a Production Organisation Approval (POA). ETSO applications for APU require a DOA. An application from a non-EU organization for the EASA validation of a non-EU part approval. The application must be made in accordance with any Working Arrangement or Bilateral Agreement. If these are missing the application will be considered as a new ETSOA and the organisational requirements mentioned in paragraph 1. will apply. What is an ETSO approval and where can I find the corresponding regulations? The ETSO (European Technical Standard Order) authorization represents one way (and not the only way) to have parts and appliances approved. This is an optional step which ensures that a part or appliance complies with a minimum performance standard. In all cases, the installer must apply for an installation approval on-board the aircraft. He/she can use the ETSO authorization and he/she complements it to demonstrate that the installation complies with the applicable certification basis for the changed aircraft. European Technical Standard Order authorizations are covered by Subpart O of Part-21 which is the Annex to Commission Regulation (EU) No 748/2012. You can find a list of the ETSO standards in the published list ETSO Index. The certification specifications for ETSO are published here. Is the ETSO authorization holder required to hold organisational approvals? An ETSOA holder could either hold a Product Organisation Approval (POA) or be linked through an agreement to an independent POA or produce under the provision of Part 21, subpart F.
The ETSOA holder is also required to hold Alternative Procedures to Design Organisation Approval (ADOA). For an APU approval a DOA is mandatory. The organisational requirements do not apply to applications from third countries that have signed a full bilateral agreement with the EU. Can an ETSO Authorisation Holder task different production organisations for the production of articles covered by one ETSO Authorisation at the same time? This is not allowed and is explained below. According to Part 21 subpart O, the ETSOA holder is responsible for the manufacturing of ETSO articles [see 21.A.602B(a), 21.A.607, 21.A.609(a)]. Considering the general provisions of 21.A.2, for those ETSOA holders that do not wish to manufacture, they have the possibility to have an agreement with another natural or legal person for the production of the article. In this case, only this other natural or legal person is allowed to manufacture the article and mark it accordingly. According to 21.A.2 an ESTO article cannot be produced by two different natural or legal person at the same time. the one natural or legal person with which the ETSOA holder has such agreement manufactures the article. For the one natural or legal person with which the ETSOA holder has such agreement the following has to be considered. In cases where Part 21 Section A Subpart G is applicable, such as to produce ETSO articles, a letter of agreement to produce under Part 21 Subpart F should not be given unless an application has been made for organisation approval under Subpart G, and reasonable progress is being made towards compliance with Subpart G. Long-term production under Part 21 Subpart F will not be permitted. Can an ETSO Authorisation Holder task different production organisations for the production of different articles covered by different ETSO Authorisations? Yes, an ETSO Authorisation Holder can task different production organisations for the production of different articles covered by different ETSO Authorisations, as long as for each ETSO Authorisation only one production organisation is tasked. How do I inform EASA about minor changes? Generally, if changes are classified minor and do not require a change to the certificate, any method to inform EASA is accepted. This notification should be sent to etsoa [at] easa [dot] europa [dot] eu. It is required to regularly inform EASA about minor changes (at least once per year). The notification can be performed by either providing a summary of changes or the full descriptions of changes. However, even if no changes had been performed on the ETSO article(s) EASA shall be notified at least once per year that no changes had been performed. When changes involve a modification to the ETSO authorization, then it is necessary to submit an application through EASA Form 34. The minor change shall be entered in section 3.1 of Form 34. How do I know whether my proposed change is minor? The ETSOA holder can perform minor changes. However, he has to inform EASA about minor changes. Major changes lead to a new ETSO authorization. As a general criterion, a change could be classified as “minor” if it doesn’t require a complete re-investigation for assessing the compliance to the applicable requirements. For minor changes to ETSO articles, per Regulation Commission Regulation (EU) No 748/2012 article 21.A.611(a), the root part of the part number is unchanged and the minor change is identified via “open brackets”. Per 21.A.603(b), an open bracket system should be proposed to accommodate a series of minor changes to an ETSO article. NB_1: Any change has to be substantiated regardless if the change is classified minor or major; the responsibility is on the ETSOA Holder. NB_2: substantiation by test does not automatically mean that the change is “major”. An example for a major change would be the use of a revised ETSO standard. Major changes are submitted through EASA Form 34 and are considered as a new application. My company name has changed. Do I have to apply for a re-issuance of the ETSO certificates? It is up to the ETSOA holders to decide whether they require reissued approvals to reflect the transfer of ownership on the certificates. In case they decide to have the certificates reissued they must file an application through EASA Form 34. The task is charged by the working hours needed. 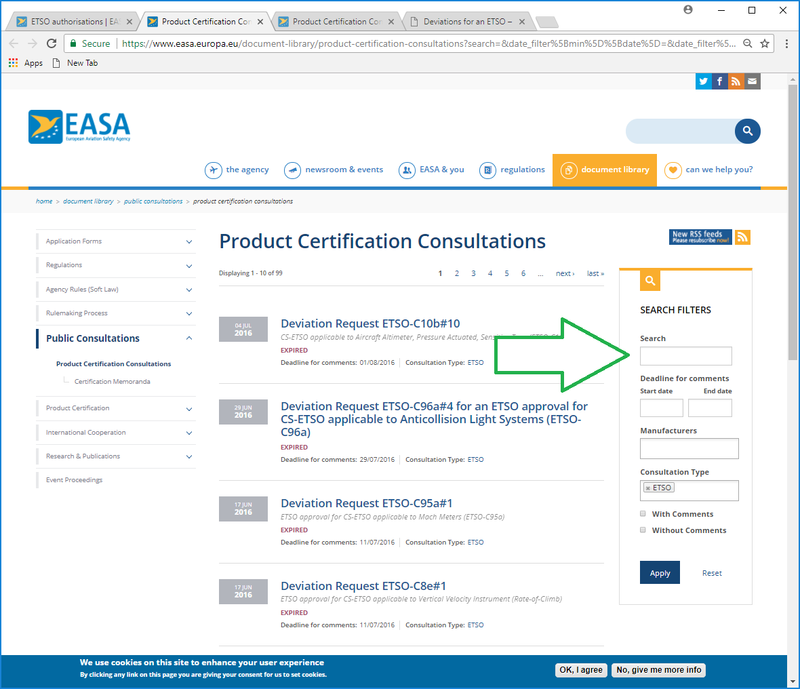 In case the ETSOA holder decides to only inform EASA on the transfer of ownership, EASA will not reissue old certificates, but change the name of the approval holder for new authorizations, and in the list of ETSO authorizations published on its website. The only way for an ETSO Authorisation to change owner is according to Part21.A.621 a change of ownership of the holder of the ETSO Authorisation. A change of ownership can affect either the entire organisation or only a part thereof. If only a part of the organisation changes owner, both parts have to show that they comply individually with Part 21 requirements for the ETSO Authorisations that will be held by the individual parts of the former united organisation, before the ETSO Authorisations can reflect the new ownership. When no change of ownership of the holder of ETSO Authorisation is involved and only the ETSO Authorisation design data are changing owner, the original ETSO Authorisation holder should surrender its certificate(s) and the new owner of the design data may apply for new ETSO Authorisation(s), partially using the original compliance data, if available. This application requires that the organisation of the new owner complies with Part 21 requirements for design and production organisation. What is a DDP and what information should it contain? DDP stands for Declaration of Design and Performance; it is the central summary document containing the definition and all relevant references of the article. Its informational content could be compared to the one of a Type Certificate Data Sheet for products. In it the applicant is required to state that the article is designed, tested and manufactured in compliance with the applicable sections of Part 21 and CS-ETSO. A standard form can be found on AMC 21A.608 (ED Decision 2003/1/RM of 17 October 2003). How does EASA process requests for deviations? If the article design deviates from the requirements of the applicable ETSO standard the applicant needs to request an approval of a deviation in accordance with Commission Regulation (EU) No 748/2012. On the ETSO authorizations page we have listed all previously approved and rejected deviations sorted by ETSO standard. If the deviation in question has already been approved by EASA earlier please indicate so in the corresponding section of Form 34. If your request is regarding a new deviation you need to provide a deviation request to EASA. To get the deviation request accepted the applicant needs to provide a substantiation showing an “equivalent level of safety”. The PCM includes all relevant information in a consultation paper. The consultation paper is sent to the applicant for verification. The consultation paper is sent out for internal consultation in accordance with the Management Board decision N° 07-2004. Taking into account the comments received from this internal consultation, the PCM modifies the consultation paper for public consultation on the EASA website. The commenting period is 3 weeks. Received comments are collected in a Comment Response Document (CRD) which will be published with the list of approved or rejected comments. The deviation is either accepted or rejected and will be included in the corresponding list. In case of an accepted deviation the ETSO certificate is issued once compliance with all applicable requirements is demonstrated. How to get the list of deviations that one can use for a specific ETSO? Deviations of other applicants can be reused in an application for ESTO Authorisation, provided an equivalent level of safety can also be provided with your design. To find all the deviations that can be reused, one has to look at two different locations, depending on the date of approval of the deviation. For deviations first used in an Authorisation before January 1, 2013 consult the list of approved deviations. For all other deviations a search function is provided. To limit the displayed deviation to a specific ETSO enter the ETSO number in the field named search and click on Apply. To limit the display to deviations for which the consultation ended during a specific period, select the start date and the end date in the calendars that pop up, when you click in the fields named Start date and/or End date. It is important to select every time the day of the month in a popped up calendar before you click on Apply, because otherwise the date will not be updated for the following search. Which technical documents are mandatory to receive an ETSO authorization? There is not a generic list; the documents to be submitted are those necessary to show compliance with the specific ETSO standard. What other documents are required/advisable? a matrix/report for the requirements not covered by testing or analysis based on test. How shall I maintain my certified emergency parachute? Emergency parachutes are neither installed on aircraft as a component nor are they required by Commission Regulation (EU) No 965/2012 (Air Operations). As a consequence emergency parachutes are not subject of EC Regulation No. 1321/2014 (Part M). The owner of the emergency parachute is responsible for keeping the emergency parachute in a proper condition in accordance with the approved instructions published by the manufacturer. Rigging of emergency parachutes has to be performed in accordance with the approved instructions published by the manufacturer. There might be additional national regulations which might also have to be considered. Any repair or maintenance, other than rigging, in accordance with the approved instructions, shall be carried out only by either the parachute manufacturer or an organization which is authorized by the manufacturer. Can I apply for an ETSO authorization for articles with embedded military functions? From an ETSO authorization perspective, it must be demonstrated that the military embedded functions do not interfere with the CS-ETSO functions. EASA will not investigate the military functions. Moreover, if there are some restrictions regarding access to design data for the military functions, EASA cannot offer any special guarantee for the special access and protection of military data. So far, there has been some case by case arrangements in order to delegate the technical investigation to NAAs which can offer resources that comply with military requirements for special data access and protection. If the article is designed exclusively for military use, EASA is not legally competent to issue an approval. Can parachutes receive an ETSO authorization? Personnel parachutes within the scope of EASA are only emergency parachutes for glider and aerobatics pilots. All other parachutes (recreational, tandem etc.) are under the responsibility of the relevant Member States. EASA has published a list of parachute approvals granted by NAAs prior to EASA, which fall under the EASA responsibility. Click here for details. How do I know whether my article has received EASA approval? The lists of ETSO and JTSO certified articles are available here. There you will also find a list of parachutes under the responsibility of EASA. However please note that this list is complete only with regard to the ETSO authorizations and might not contain all JTSO certified articles. How do I know whether an approval has been grandfathered? Any article approved or validated by any member state before the establishment of EASA is deemed to be 'Grandfathered' under Commission Regulation (EU) No 748/2012 Article 6 . You can find the JAA approvals listed on our website. There is a large number of old national approvals which were issued before 28th September 2003 but due to the lack of full national records a comprehensive database could not be published. We recommend any enquirer to contact the approval holder (manufacturer of the article) and check with them directly whether they have received any national approval for the subject article. Another option would be to check with the NAA that issued the approval. Approvals issued during one of the time periods indicated with “validation required” are not grandfathered and need validation by EASA. EASA approvals and grandfathered approvals are valid in all EU member states as well as Norway, Iceland, Switzerland and Liechtenstein. How do EASA member state organisations apply for a validation of ETSO authorizations in a third country? An ETSOA can be validated in a third country provided there is a bilateral agreement or working arrangement in place; see the list published here. Applications should be made through EASA Form 41. Based on the bilateral agreement, EASA will carry out the technical investigation on behalf of the foreign authority. EASA will provide you with a quote on how many hours would be needed to perform this technical investigation. (Please copy the PCM and etsoa [at] easa [dot] europa [dot] eu). What is TSOA/ETSOA reciprocal acceptance? After 2nd March 2016 (issue date of TIP Rev 5, later on replaced by TIP Rev 6 issued on 22nd September 2017), the TSOA/ETSOA reciprocal acceptance is the process by which the importing authority will accept the exporting authority’s approval of a TSO article without the importing authority issuing an approval. In plain language, this means the FAA will accept an EASA ETSOA for an article from the European Union (EU) and the FAA will no longer issue a Letter of TSO Design Approval (LODA). Likewise, EASA will accept the FAA’s TSOA for an article from the United States without issuing an ETSOA. New validation requests will not be accepted. Where to download ETSO related files? What is the EASA position on PMA (Parts Manufacturer Approval) approvals? EASA has documented how an approval can be issued by the Agency to an organisation under the regulatory oversight of the FAA for a part designed under their PMA system. Refer to EASA policy in ED Decision 2007/003/C. What can I do if I do not need the certificate anymore (surrender of certificates)? In general the ETSO authorization needs to be in place for continued airworthiness purposes. Even if your company might have stopped production a long time ago there could still be units in service. notification of the revocation to the public. Following this, a PCM would check the issue and if found o.k. we would issue a Certification Information with comment period and following the feedback received, later the final Certification Information. The PCM will also decide if it is necessary to have a comment period or if the issue can go right to the decision and the final certification information. Once the surrender has been decided you will receive a decision letter and you will have to return the original certificate to EASA. The Certification Information is published on the EASA website on the latest news page and also under the Type Certificates Information page. What is an EASA form 1? The EASA Form 1 is the Authorised Release Certificate released by a POA holder for stating that a product, a part, or a component was manufactured in accordance with approved/not approved design data. NB: the same for is suitable for Maintenance Organization as well. Exhaustive explanation how to fill the Form 1, can be found in Appendix I of Part 21 (page 87). Where can one obtain a copy of the MOPS for ETSO C109? Copies of Global Systems, Inc. document “Minimum Performance Standards (MPS) for the Airborne Navigation Data Storage System,” dated March 31, 1983 may be purchased from Global Systems, Inc., 2144 Michelson Drive, Irvine, California 92715, ATTN: Production Manager, Navigation Data, Telephone: (714) 851-0119. In 1985 the cost for a single copy was $10.00 to cover postage and handling. Global Systems, Inc., permited the document to be reproduced and used without further authorization.